Determining what is the best miter saw for you depends how you want to use it. With prices ranging from about $200 to well over $1500, we can help you pick the perfect tool. 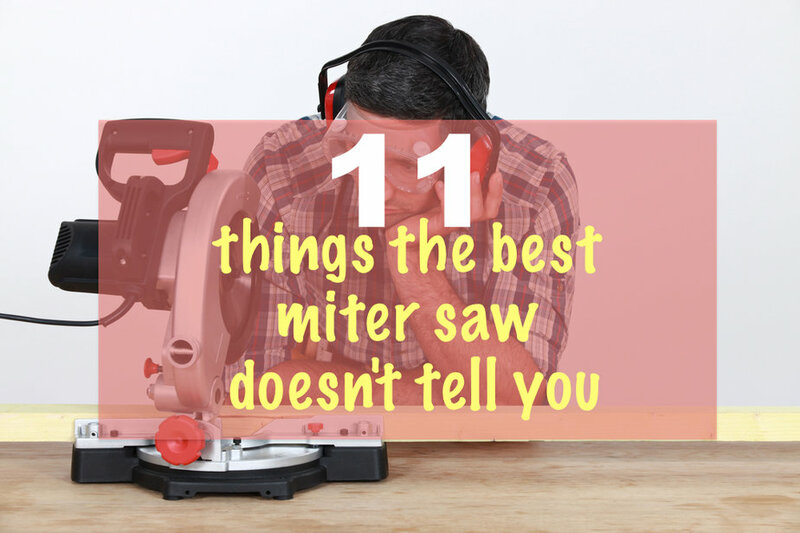 The following 15 aspects also show how to use a miter saw. They will help you find the perfect miter saw for you. 1. Are you going to move the saw from site to site? 2. Do you need smoother cuts or the ability to cut thick stock? 3. Is the extra cost and possible loss in accuracy of dual bevel cutting important to you? 4. How much cutting power do you need? 5. Do you need a light show? 6. Check for a solid table and fence. 7. Safety features are vital. 8. The tool should do the work. 9. What accessories will you need? 10. Do you want the saw to slide or not? 11. How is the miter angle set? 12. Do you need to manage dust? 13. How important is noise? 14. Are you a lefty? 15. How helpful is the company? At the hardware store, pick up each miter saw and set it down on the floor. Then pick it up and put it back. Was it too heavy, or did you have to grip sharp edges to pick it up? Would walking with the saw kill your back? Check to see if the saw head can be locked down while it’s being moved (or when it’s not being used in your shop). Miter saw sizes range from about 7 ½” to 14”. Most for regular use are either 10 or 12”. 10” blades typically rotate faster, and in many cases this results in a smoother cut. 12” blades can cut thicker stock, and manufacturers usually supply 12” saws with beefier motors. The choice might depend on your other tools. If you have a table saw that uses 10” blades, a 10” miter saw might best so the two tools can use the same blades (but note the “rake” on the blade). Some sawing situations call for angle cuts on 2 dimensions. Crown moulding calls for cuts at an angle as well at a bevel. Saws that can “lean” to bevel both right and left are called “dual bevel.” They eliminate the need to flip over a piece of moulding to cut the correct angles. Some woodworkers think switching from left to right bevel throws off accuracy, but some better-manufactured saws have gauges to aid with precision. A higher amp motor will provide greater cutting power and will run cooler. Most miter saws with 10” blades or larger have 15-amp motors. Not all motors are created equally, though. A 10-amp motor on a 10” blade saw could be better for you than a 15-amp motor. Amperage rating should be considered in conjunction with rpm (similar to horsepower and torque in car engines). Some contractors swear by laser guides and some don’t. Lasers have to be tested for accuracy occasionally, but, once set up, they can make perfect cuts quickly. Remember that laser guides do not take kerf width into account. Aftermarket laser guides can also be added. Because they are portable, miter saw tables and fences are not as rock-steady as a table saw or old-timey radial arm saw. Grab a straightedge at the tool store to see if both the table and fence are flat and straight. A bowed fence is the cause of many imperfect cuts. Also check for a perfect right angle between table and fence. All saws have safety features such as trigger locks and blade guards. Sometimes fumbling with these features creates a hazard in itself. Easy to use safety features will ensure they are used correctly and consistently. Radial arm saws can also crosscut with precision, but they usually require time spent tuning and alignment. Setting angles and bevels and locking them in should be simple. Also check for ease in changing blades. Hold-down clamps are great, but you will only use them if they are easy to set up. Other helpful accessories are table extensions for long stock. Stands are also usually available, and some have wheels. Bear in mind that you can make and customize some accessories (like stops and special fences). Sliding miter saws usually weigh more than non-sliders. The slide feature does allow cutting wide stock, but some believe precision is less (especially with 12” saws. Also keep in mind that sliders take up a little more shop space. Many woodworkers say that once you use a slider, you won’t want to use a non-slider. Check how easy it is to set odd angles. Also check to see if the saw has a secondary micro adjustment; this is optional but nice. Dust is usually not an issue on an outdoor job site, but inside, dust can start in the shop and get carried throughout the house via HVAC. Many miter saws have a dust collection bag or port to keep things clean. The best ports allow for swiveling. Dust collection systems should never get in the way of your job. It is smart to wear ear muffs when using power tools, but the loudness of the saw might be an important consideration. When more than one power tool is operating at once, or in the in-home work site, noise is a factor to consider. Miter saws with induction, as opposed to a motor with brushes, are undoubtedly quieter, but they always cost more and are usually heavier. Blade selection can make some difference in the loudness of the miter saw, too. Some saws do not allow for left-handed use. Check out manufacturer web sites to get an idea of how accessible their customer service is. Also check warranty figures and stipulations. Miter saws have one job: crosscutting. We hope these suggestions help you determine what is the best miter saw for you and provide some detail on how to use a miter saw.